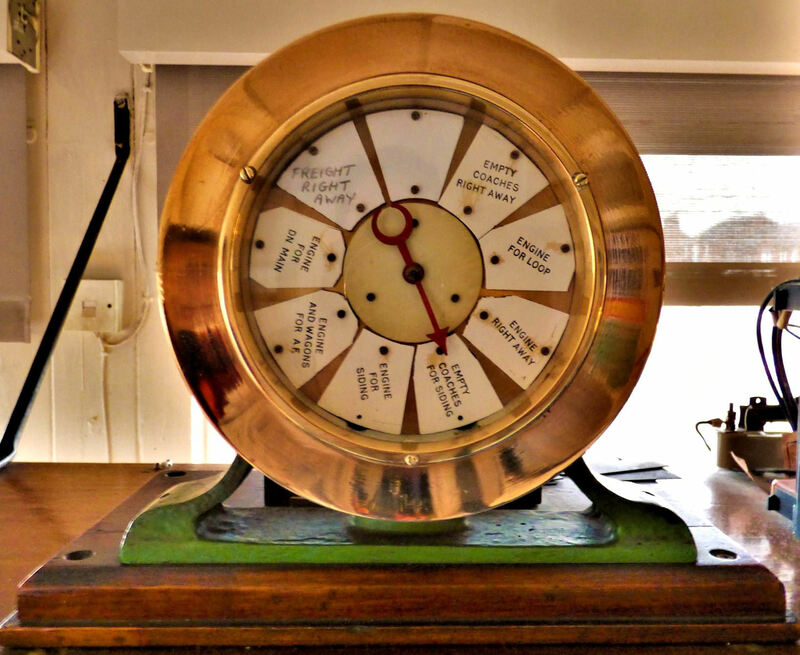 What can only be 'described' as a museum piece, a (no longer used) train describer in Abbey Foregate Signal Box. This was a short notice (repeat) visit announced by special Society email message - rather than not taking up the offer - as the notice was incompatible with the next BLN date and oversubscribed several times over. Fortunately there should be plenty of time to arrange future repeats as participants were told that the life expectancy of the boxes could even now be up to a further 20 to 30 years! Replacement by a power box was first considered in the 1960s and came close to fruition in the early 1990s but, as ever, financial constraints intervened and four of them are still here! BLN 1255.759 (of 23 Apr 2016) is a comprehensive well illustrated report of a similar fixture on 9 Apr 2016 so a few notes should suffice here. Dorrington and Craven Arms signal boxes were not visited this time but it was possible to include Crewe Junction which was missed last time and it was a definite highlight! Like the unique, impressive Severn Bridge Junction it is of LNWR 1903 origin. 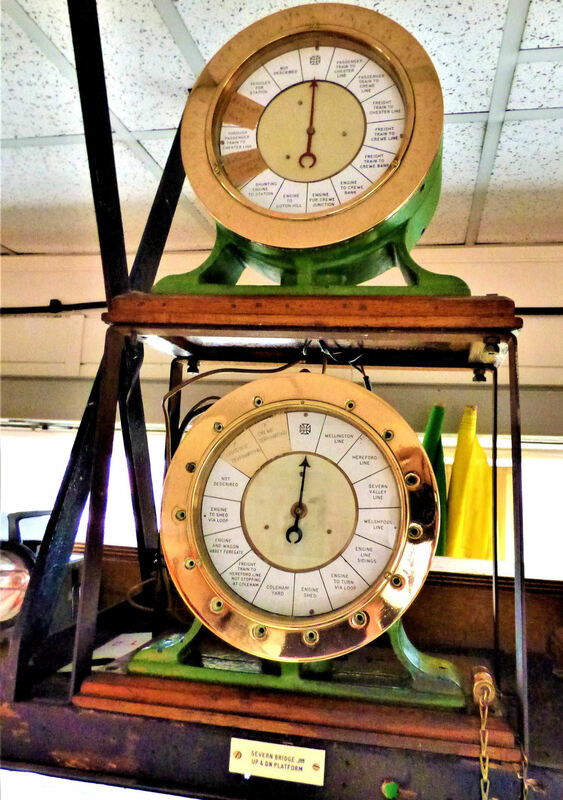 Its historic Grade II listing extends to the block shelf which retains a selection of mechanical train describers, the former block instrument to Crewe Bank and other long superseded but lovingly cared for museum pieces amidst the active equipment. Crewe Junction: The modern equivalent Train Describer (a VDU screen and keyboard) handles the handover of trains to/from the Crewe line under Track Circuit Block regulations. The box also works Track Circuit Block to Gobowen (North) on the Chester line but, in that case, trains are described using bell codes via a traditional bell and tapper. To the south, it works Absolute Block to Severn Bridge Junction using three GWR 1947 design block instruments. One works the bidirectional Up & Down Platform Line (P4), one the Main Platform Lines (P3 and 7) and one the two Main (non-platform) Lines. The frame has 120 levers (Severn Bridge Junction has 180) but a much smaller proportion are spares - roughly 25%. This is because over the years it has absorbed functions from other long abolished boxes, including the Station Box and several on the Chester line. It now supervises all level crossings on that line to, but now excluding, Decoy (185m 66ch); the latter was handed over to Gobowen (North) quite recently. However (despite TRACKmaps Book 3, p31B Jun 2018) Crewe Junction retains the release for the mothballed Babbinswood (Whittington) oil depot frame (186m 46ch). It controls semi-automatic signals at Baschurch (Down) and Stanwardine (Up) too via a small Individual Function Switch panel. The box is single manned but the illuminated track diagram is duplicated above either end of the lever frame. 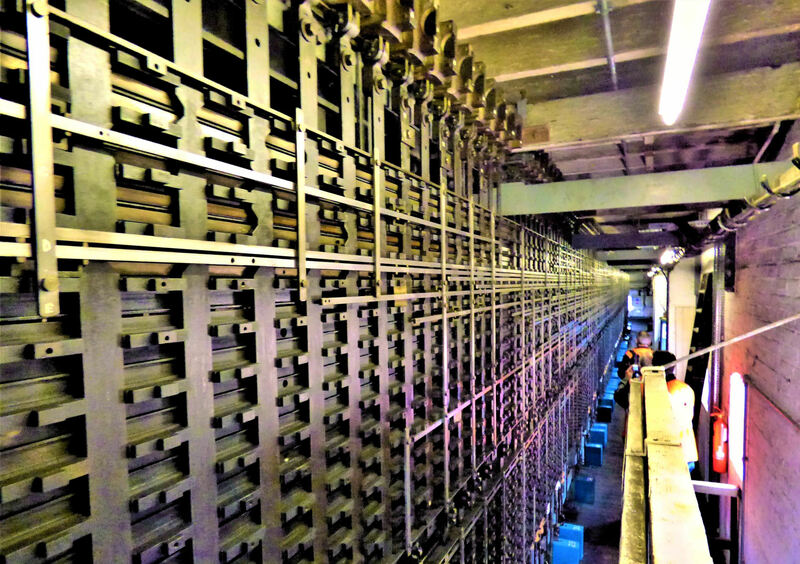 A small panel controls the slotting arrangements with Wales Railway Operating Centre at Cardiff for the Crewe line. Amending the previous report: the acceptance levers at Crewe Junction and Severn Bridge Junction control P4 (not P3), this is the only wholly bidirectionally signalled line. Of the other two through platforms, trains can only reverse at the south end of P3 and the north end of P7. Thus the current platform layout at Shrewsbury is actually quite inflexible for modern traffic. The remaining boxes remain much described in BLN 1255 of 23 Apr 2016. 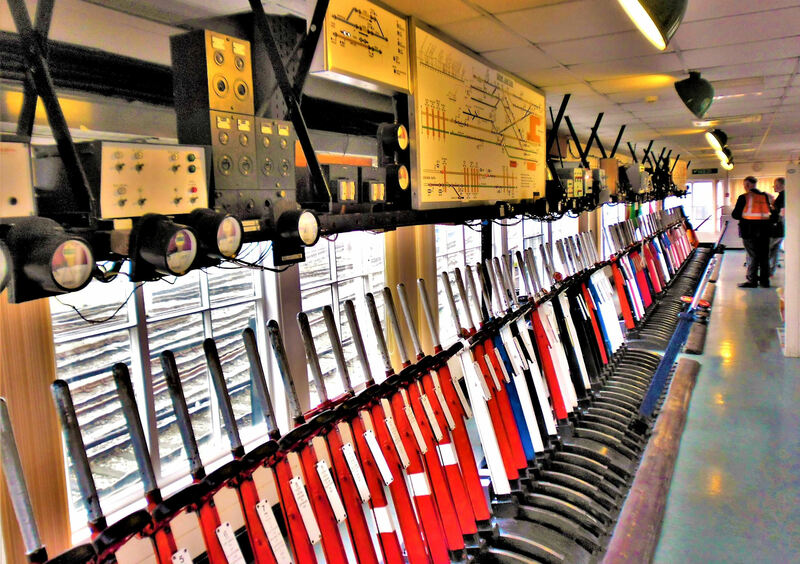 However Sutton Bridge Junction is now open continuously, the signallers typically working three 12 hour shifts per week. 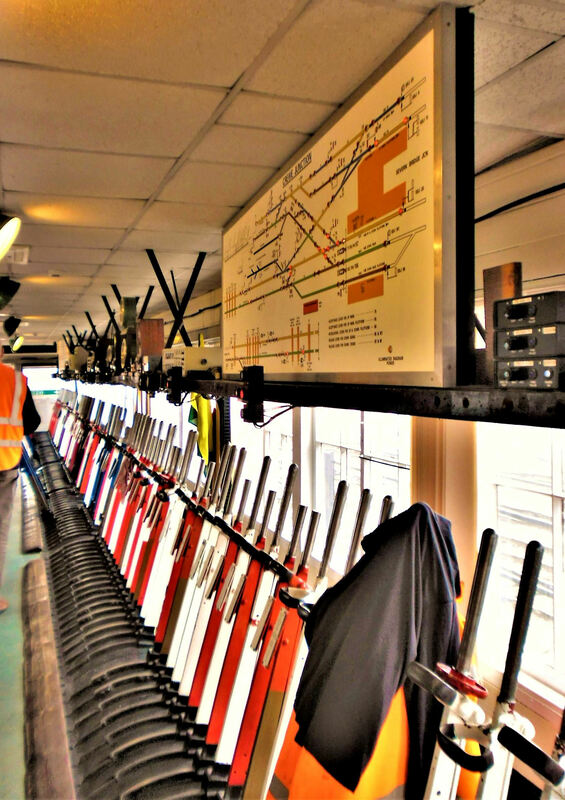 A Web 'Gemini' terminal is an innovation in Severn Bridge Junction; this is in effect the stock allocation and diagramming equivalent of Realtime Trains. It is of particular value at this location because of the number of trains which join and split here, sometimes with late changes of plan. It is not currently in the public domain, but its potential usefulness to enthusiasts is recognised so that could change! Thanks as ever to the NR staff and signallers for their friendliness and willingness to answer questions, in this fascinating area, and to Barney Clark for all the arrangements. A memorable day with some more items ticked off the bucket list and a donation of £330 to NR's nominated charity Barnardo's. Crewe Junction Signal Box, the frame and instruments, looking north from the south end; the diagram is repeated at each end of the lengthy single staffed box. 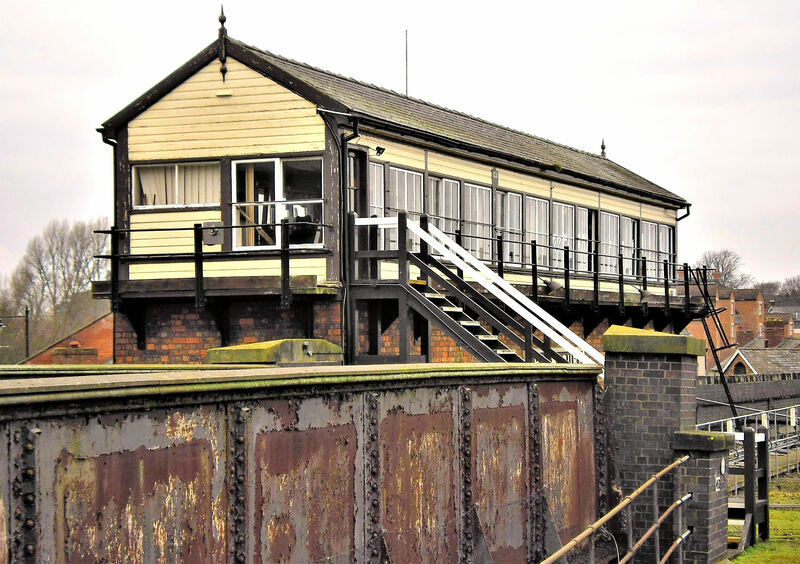 Crewe Junction Signal Box exterior as seen from Shrewsbury P3. Crewe Junction Signal Box, the frame and instruments, looking south from the north end. 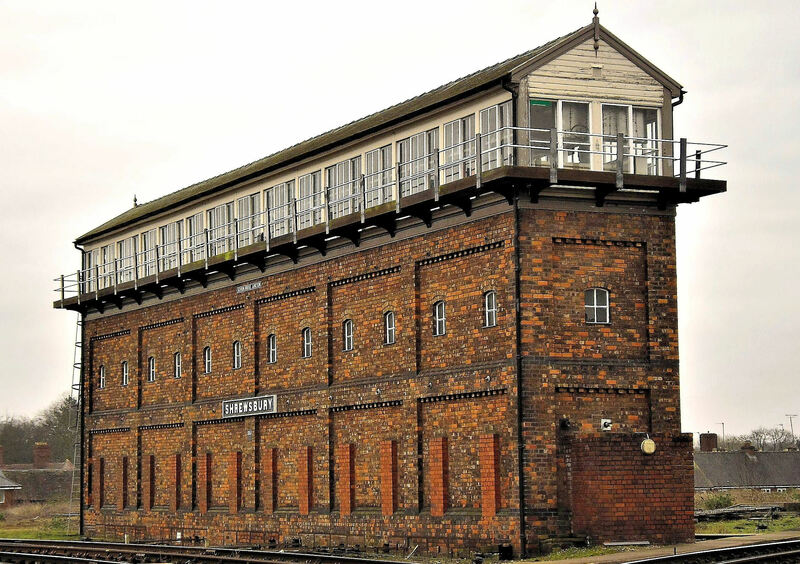 The one and only Severn Bridge Junction Signal Box, the world's largest operational manual signal box (previous record holder: Spencer Street No1 Box in Melbourne with 192 levers). Severn Bridge Junction Signal Box part of the massive locking room beneath the frame, an impressive and very effective Victorian computer system. An antediluvian train describer (no longer used) at Severn Bridge Junction which even includes the Severn Valley line.